Epson EH-TW2900 review | What Hi-Fi? Seemingly paying little notice to notions of exterior styling, this is another bulky beast that would be as happy on a shelf of cooling fans and microwaves as it would surrounded by AV kit. Still, it's what's inside that counts, and here you'll find plenty of cutting-edge projection technology. Most noteworthy is perhaps the automatic iris mode, which busies itself constantly with making minute adjustments to your picture so that you see it at its very best. It proves fruitful, too, delivering worthwhile improvements without being distracting in operation. All the right specification boxes are ticked. This Epson LCD projector proudly sports a Full HD 1080p resolution, two HDMI inputs and a versatile throw ratio that allows for plenty of flexibility when it comes to positioning – provided you can find room for the main unit. Still, that size comes in handy when it comes to cooling, with plenty of room to ensure it's very quiet in operation. 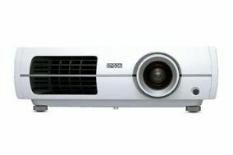 The enticing figures are not only inside: Epson's three-year warranty on the projector and lamp adds another bargaining tool to your box should you have an other-half to persuade. Thanks to its easy to follow menus, this is a doddle to get up and running and we're soon enjoying Terminator Salvation. It shows that the '2900 is adept at digging detail out of dark scenes, although contrast levels don't quite match the best, and leave a gloomy picture that could do with a little more clarity and solidity to the image when the lighting is low. Talking of solidity, while motion is handled comfortably and with no great signs of distress, lines could be more sharply drawn at times, with the precise detail in Land Of The Lost not quite as crisp, clean and punchy as the very best rivals. There's much to like, though, with bright, colourful scenes. These reveal the Epson to be more than capable of delivering the quality required. A wide colour palette allows for a vital, punchy image, with South Park looking great, and given as much of a sense of three-dimensionality as the deliberately lo-fi animation allows. The bar is mighty high for projectors of this price to jump up to but Epson's EH-TW2900 makes a fine job of it. It can't quite hit the heights, but certainly gets within touching distance.